Taylor Hackford started as a mailroom clerk at L.A.'s public TV station, KCET, where he worked his way up to investigative reporter and eventually won two Emmys. He won an Oscar in 1978 for his first short film, Teenage Father, starring Suzanne Crough (the youngest member of The Partridge Family) as the teenaged mother. Hackford has since become known for enjoyable if somewhat longwinded dramas like An Officer and A Gentleman, Everybody's All-American, The Devil's Advocate, and an adaptation of Stephen King's Dolores Claiborne. Hackford's biggest hit was Ray in 2004, after he spent 16 years trying to get the biopic financed. Its subject, Ray Charles, died just weeks before the film opened. 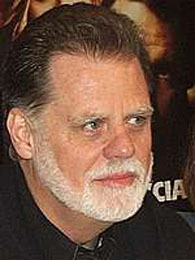 In 2002, Hackford signed on as a co-plaintiff in the Directors Guild's lawsuit against a "family-oriented" video company called CleanFlicks, which had re-edited Proof of Life to make the movie OK for ninnies. CleanFlicks had removed the entire opening sequence involving rebel brutality, deleted the film's first killings, and edited out the subsequent kidnapping that set the plot into motion.